Diamondback Overdrive 29er Review | Why Its So Demanding? 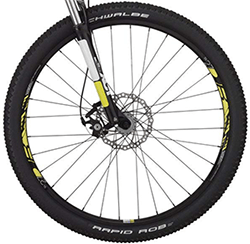 Pros ReadyRide features, 29″ Large wheel, Shimano drivetrain, 80mm suspension fork. Cons Uncomfortable saddle, Need to replace the pedal too. Summary Strong hardtail bike for entry level rider. Works great on all kind of terrain. Finding a reliable hardtail mountain bike at an entry level can be tough. 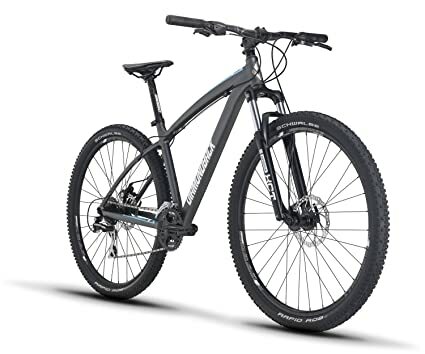 However, after extensively reviewing the Diamondback Overdrive 29er bike, we are confident that we’ve found a fantastic bike for people who are new to mountain biking. The price is incredible, especially when you take into account the number of fantastic features that it has to offer. All of the components of this bike come together to enhance your riding experience. All of the research has been done so that you don’t have to spend time doing it yourself. Simply have a read below to learn everything you need to know about the Overdrive 29er. This bike was created for people who want to ride across bumpy terrains with smoothness. People who are looking for a bike that allows them to ride in a comfortable position will appreciate the geometry of this bike. The frame is one of the most crucial parts that can make or brake the quality of a bike. So, is the frame fitted to this bike of a high standard? 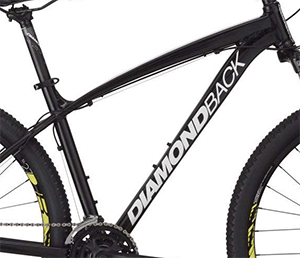 Diamondback has implemented a 6061-T6 frame that is constructed with aluminum materials. Therefore, we were glad to find that it provides the bike with a fantastic sense of durability. This is an incredibly important factor when it comes to riding on tricky terrain. If your bike isn’t built to withstand some damage, you’ll end up buying new ones more often than you’d like. But that’s not the case with the Overdrive 29er. Furthermore, we noticed that the frame on this bike is incredibly strong, while also remaining lightweight too. As a result, you can be sure to maneuver it with ease and experience more controlled trail riding at faster speeds. When it comes to mountain biking, many people never experience a smooth ride. In fact, it’s common to think that riding smoothly on mountain cycles is impossible. Well, with the fantastic suspension system that’s fitted to this bike, it is most definitely possible. The Overdrive 29er incorporates a Rockshock XC 30 TK suspension system that has 80mm travel fork. This provides you with an incredible amount of stability while riding. We found that it’s very effective at minimizing the amount of bumps that are commonly felt while riding on rough terrain. Therefore, this makes the ride a lot smoother. We also liked how this means that riding this bike requires a lot less effort. So, you can enjoy the experience of longer rides, without getting tired as quickly. Riding through challenging terrain means that you need to have a wide selection of speeds available. If not, riding up and down steep hills will prove to be very tricky. That’s why we were glad to find that the Overdrive 29er provides you with a fantastic gear and drivetrain mechanism. They are made with high-quality Shimano parts, and they provide you with a total of 24 speeds to choose from. This is an impressive range of gear choices which means that you can always be sure to select the correct one to suit your specific riding conditions. Furthermore, shifting through the 24 speeds available is incredibly easy and accurate. Since they are Shimano parts, you can also feel confident in knowing that you can rely on the gears and drivetrain during the more difficult riding surfaces. 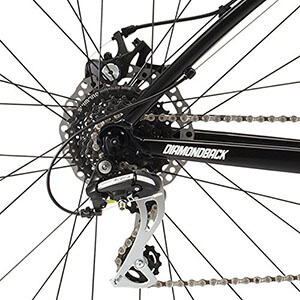 The Diamondback Overdrive 29 mountain bike implements a hydraulic braking system. We appreciate how Diamondback has included Shimano parts for the brakes too. They have proven to be remarkably effective at bringing you to a complete standstill immediately. This is a feature that all mountain bikers should be looking for. Since the terrain is more challenging to navigate, you will be given a boost of confidence by having an active braking system to rely on if needed. These hydraulic brakes are also excellent in all weather conditions. Even if it’s pouring down with rain and the surface is slippery, the brakes will always bring you to a safe stop. Moreover, the brake levers feel incredibly easy to use too. This means that you can experience more responsive and effortless braking. This is an excellent feature for people who love to ride at faster speeds. Do the tires improve the overall performance of this bike? The wheels that have been fitted to this bike are Schwalbe Rapid Rob, and they are 29 x 2.25” in size. 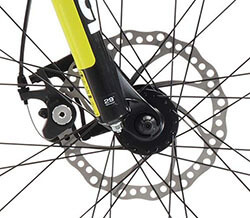 Therefore, they come with a pretty impressive diameter, which is precisely what you need for mountain biking. When riding on off-road paths, there are a lot more bumps and tricky surfaces that you can’t always anticipate. So, having high-quality tires is a must. The Schwalbe Rapid Rob ones that come with this bike provide you with the ability to ride across all kinds of surfaces with no hassle. Furthermore, a Kevlar belt has been incorporated into the design of the tires. We liked this feature as it provides your tires with an added layer of protection against punctures from the off-road terrain. As a result, you can be sure that these tires will last you for a long time. The overall size of this mountain bike is larger than you may be expecting. However, the way that they’ve designed the geometry feature means that riders of all heights will feel very comfortable while riding. We found that the geometry of this bike is suited well for mountain biking. This is because it can accommodate well to all kinds of riders. If you’re looking to ride through trails at faster speeds, you can feel comfortable and stable while doing so. Those who want to enjoy longer rides can also feel completely stable and comfortable too. Answer: The DB Overdrive 29er weighs a total of 50 lbs. Question: Are there any quick-release features on the wheels? Answer: Only the rear wheel comes with a quick-release feature. Question: Is there a lockout system available for the fork? Answer: No, this bike has no fork lockout feature. Question: Is that bike have quick release feature? Answer: Yeah, The Overdrive 29 have rear wheel quick release feature. Question: Do I need to adjust the brake frequently? Some customers have mentioned that they aren’t happy with the saddle. We didn’t include this in our cons section because this is a very personal feature to bikes. The saddle may feel fantastic for you. However, if it doesn’t, you may want to consider replacing it with a more comfortable seat. Remember its an affordable mountain bike by price but the quality is like a $1000 bike. Furthermore, when buying this bike, you’ll have it delivered to you partly assembled. Therefore, you should be ready to put together some parts of the bike for yourself. If you’re not confident in doing so, you can simply take it down to a bike shop, and they’ll handle it for you. Moreover, they will be more experienced at tuning the gears and brakes too. However, it will come at an extra cost. So, if you have had experience with assembling bikes for yourself, this one will be a breeze. With the large wheels, durable frame, and excellent suspension, this Diamondback Overdrive 29er hardtail mountain bike provides everything that a beginner needs to tackle the tricky terrain. The 24 speeds available means that you can ride up and down steep inclines with ease. Not to mention, you have an incredibly reliable set of brakes which is a great confidence booster for newbies. For the price, we weren’t expecting to find so many incredible features available. All of them are tailored to making a beginner’s riding experience as enjoyable and safe as possible.